Usually, the people believe that body language has not any major impact on telephonic conversation while receiving or making a call. But that’s not true! It is said that around 55 percent of communication while meeting face to face is through body language. Body language also plays a significant role while having a conversation on mediums like telephone (though it impact may be less as compared to face to face). This impact of body gestures on conversation happens unconsciously due to which several call centers ignore its importance. It becomes imperative to analyze the impact of body language by the call centers while conversing with the customers. Also, guiding the agents about its importance will raise the quality of customer interactions. Call center reps are often taught to keep smiling during interaction with the customers on phone. This is essential as it automatically adds more charm to the conversation and ultimately boosts the quality of the conversation. Call centers can place mirrors on the workstations of each agent which will remind the agents to keep smiling while on the phone. Several breathing exercises or simply deep breathing prior to receiving a call can prepare the agents to take the calls for customer processes. This helps in reducing nervousness or anxiety and calms down the agents, thereby making the conversation quite smooth. Breathing patterns while talking also influences the quality words spoken by the representatives. Several times, the legs of the agents are in crossed position which is a mistake. So, it is advisable to keep the legs uncrossed to ensure stability in the conversation. Generally, the customer care service agents are unable to walk while conversing with the customers as they use headphones which are connected to the computer. But if possible, agents should walk around the room while talking to the customers. 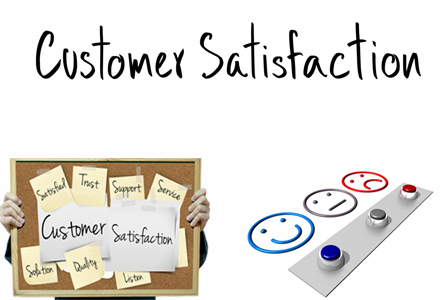 This will definitely add confidence and enthusiasm in the voice which increases customer satisfaction and reduces the time taken in problem solving. As walking while interaction is rarely possible in call centers, the agents can follow this tip that also improves the level of confidence in the communication process. Various researches have shown that sitting straight aids in remembering positive memories and recalling positive thoughts. And these constructive thoughts and memories will definitely help the agents to boost their energy and confidence level which is essential for processes like customer support. On the contrary, an executive sitting in a lazy manner will sound uninterested and bored which will ultimately give a poor impression of the company to the customers. It may sound weird but nodding in agreement or shaking head in disagreement also have their respective impact on telephonic conversation. By using these gestures on phone, the speaker (agent) feels more confident in his answer of yes or no. These gestures add to the active listening process of the communication which is essential for call center agents. As a result, the receiver on the end gets assurance that agent is trying to solve the issue in the most suitable manner. The pace and pitch of the speaker also tells the mood of the speaker. If the speaker is using slow pace, then it reflects that that he is unhappy and is about to tell some bad news. On the other hand, if someone is angry, he will be using a fast pace as compared to normal. So, remaining calm during conversation becomes essential to ensure moderation in pace and pitch. Hardly does any instructor teaches agents about this technique but this definitely works positively. Closing the eyes (if there is no requirement to look on computer screen) while talking to customer will help you to avoid getting distracted due to setup of the room or any other interruptions. One can also easily imagine that he is standing next to the caller which will help in adding more energy and excitement to the overall conversation. Broadening the gestures including hand movements and smile boosts the confidence and helps in convincing the customers about any solution or product. This is a trait of dominant personality and it surely works positively in the favor of call centers. Inclusion of body language techniques in call center training modules definitely prepares the agents in customer care service department to deliver their best performance. Some body language techniques may require constant practice to ensure that they turn into a habit. Taking the body language seriously will definitely improve the level of customer satisfaction which will lead to developing trust in the minds of consumers.